Voted as the best Liverpool F.C match day pub, The Sandon, is located on Oakfield Road which is a stone throw away from the fortress, that is Anfield. Recognised as a meeting point for Liverpool FC fans ahead of home games, this historic venue is one to recommend for a “couple” before the match, with its friendly atmosphere and great service. The Sandon has been an institution for football fans since both Liverpool and Everton were founded and is famously the “birthplace of Liverpool Football club” and is seen as one of the most iconic footballing establishments in the city. So how did it all begin? The Sandon was originally built in 1870 as an outlet for selling beers by a local brewer named John Houlding. 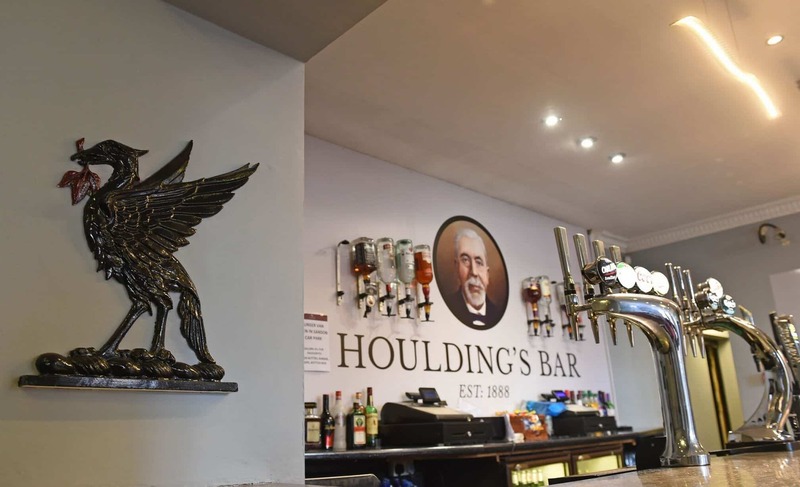 Houldings brewery, was the first Masonic Lodge in Liverpool-The Anfield lodge – and masonic symbols can be found on the ornate tiles on the exterior or the building. John Houlding, was also a self-made English businessman with an education from Liverpool college and a keen interest in football. There was only one main football team in Liverpool, St Domingo’s who were formed in 1878 and had no fixed football ground. Houlding’s interest in football led him to become more and more involved with St Domingo’s and when a ruling was passed that forced the team to play their games at an enclosed ground, a meeting was held at The Sandon. Having previously played at the public Stanley Park, St Domingo’s needed to find a field they could rent, Houlding suggested a field off Priory Road which was just up the road from Houlding’s brewery. 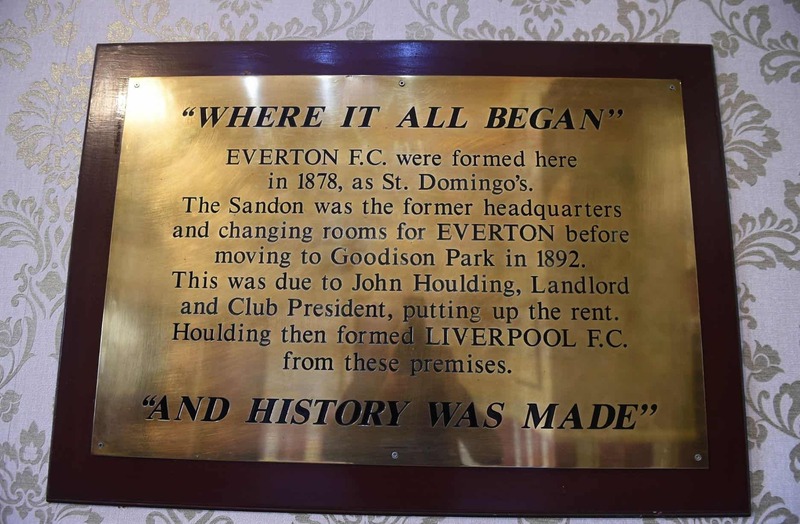 In 1879 St Domingo’s, now playing at Priory Road, officially changed their name to Everton Football Club and Houlding became their first president. The arrangement with the owner of the field off Priory Road didn’t last long and the team were eventually asked to leave. As the club’s president, Houlding secured a new pitch at Anfield Road, paying a small rent to John Orrell, a fellow brewer and friend of Houlding. The first football match at Anfield Road was played on 28 September 1884, when Everton beat Earlstown 5-0. Houlding led many Everton Football Club meetings from his brewery, The Sandon. The pub became the headquarters for the team and was used as a dressing room by the players for many years. In the early 1980`s The Sandon was re-branded as a fun pub and renamed “The Picture House”. The pub was a massive success until the decline in this sector and was closed in 1990. After numerous fires, a demolition order was placed on the pub due to it being in a state of dereliction. In 1994, George Hindley who owned Sam Dodd’s on the other corner of the block, bought the property from the brewery and began the long restoration process to what The Sandon is today. Over the years other properties were bought in between Sam Dodd’s and The Sandon and the site now has 2 public bars and 6 function rooms, one of which is named “The Houldings Suite”. 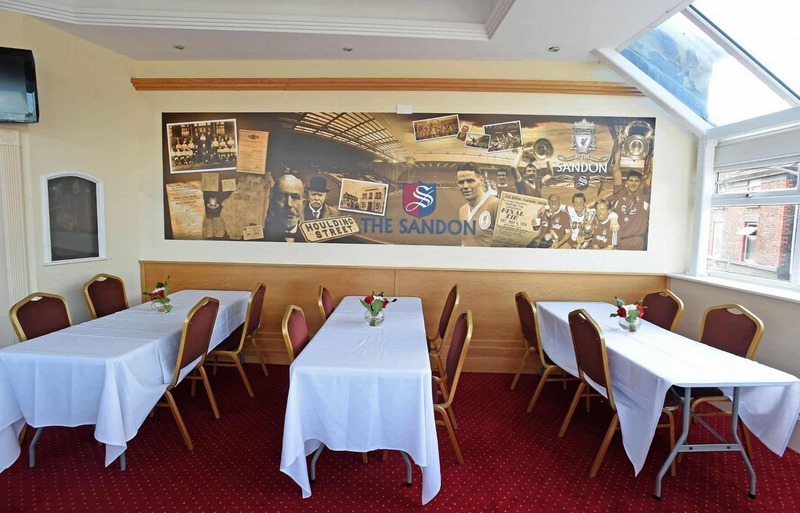 The Sandon is seen as a special place in the eyes of Liverpool football fans and was the first official LFC partner to provide corporate hospitality outside of the stadium in 2008. Offering excellent matchday hospitality in its newly refurbished function suites, guests can enjoy amazing food and great service, as well as experiencing the famous pre-match atmosphere. Whether it be a location for reds fans from the city or a place on a tourist’s list of places to see, this spectacular venue breathes history and success and is a must to visit.